"Geologists have spent decades—centuries—worrying about slumps," says Richard Alley, co-author of the new paper in Geology. A slump occurs when mass of rock or sediment loses some of its strength, breaks away from its neighboring land, and slides down a slope. Typically, slumps are marked by a steep scarp where the material broke away, followed by a block of material moved downslope. Removing the weight of the upper ice by slumping encourages the underlying ice to pop upward. "Because it's still attached at the back, it's going to rotate a little bit," says Alley. 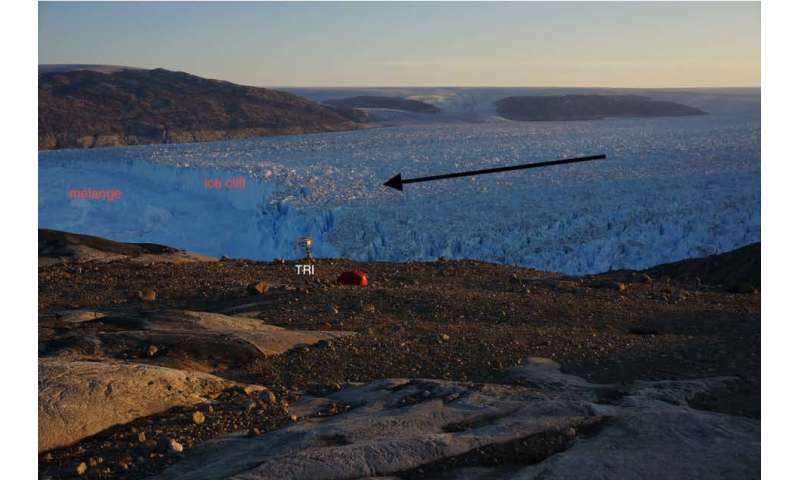 The rotation causes a crack to form at the bottom of the glacier as the ice flexes. In turn, the crack can weaken the ice, creating a large calving event—all triggered by the initial slump on top of the ice cliff. With slumping, the calving occurs without waiting for the melt. "We'll go slump... basal crevasse... boom," he says, noting that when the calving happens it will take the 100 meters of ice above the water—and the 900 meters below the water—very quickly.